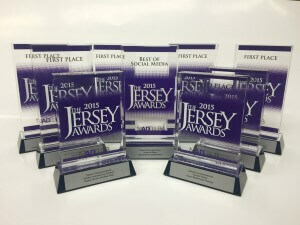 Oxford Communications earned 12 New Jersey Advertising Club Awards on June 8, 2016, including the prestigious Best of Social Media trophy for its execution of the Outlets at Tejon’s holiday #SantaPlease Sweepstakes last winter. Oxford Communications, a two-time NJ Ad Club overall Best in Show winner, was also honored with an additional five first place awards and four second place awards for creative and collaborative efforts in the areas of social media, trade publication, brochure design and digital media. The award-winning work featured campaigns for clients such as Werther’s® Original®, Brother International, Rutgers Cancer Institute of New Jersey, Bancroft, Hunterdon Healthcare and Outlets at Tejon, which garnered the biggest award of the night for the agency, Best of Social Media, for the #SantaPlease Sweepstakes – a sweepstakes launched as a way to engage and reward shoppers of the California-based outlet center during the holiday season. Consumers were invited to share a photo of a must-have(s) item from the Outlets at Tejon for a chance to win the grand prize: a $1,000 shopping spree.